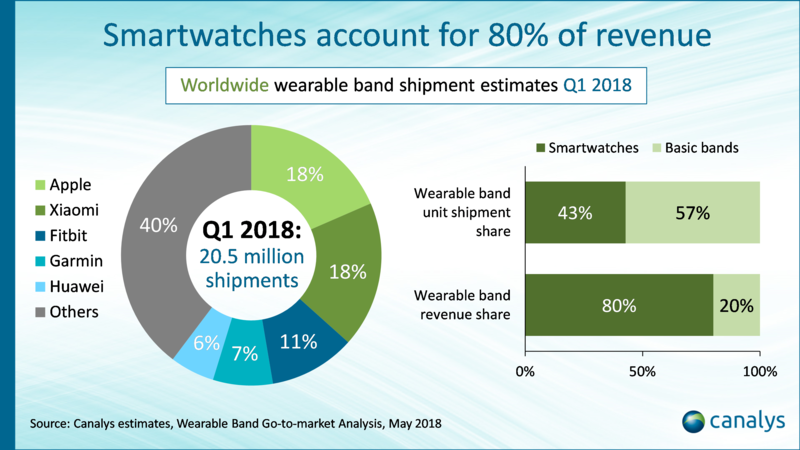 Wearable band shipments grew 35% year on year to 20.5 million units in Q1 2018, driven by strong demand for health-centric devices. Smartwatches accounted for 80% of wearable band revenue, up from 74% in Q1 2017. In terms of shipped units, smartwatches** accounted for **43% in Q1 2018. Apple emerged as the top vendor, shipping 3.8 million Apple Watches; Xiaomi, whose Mi Bands account for more than 90% of its shipments, was close behind, shipping 3.7 million units. Fitbit, Garmin and Huawei, vendors selling a mixed portfolio of fitness wearables, rounded out the top five.